Turnips are one of my favorite winter vegetables. Although they are available year-round, their flavor deepens from a delicate sweetness after the first harvest, to the more typical pungency that people tend to associate with this vegetable. Turnips hold up well to a variety of cooking methods, from roasting to purées. 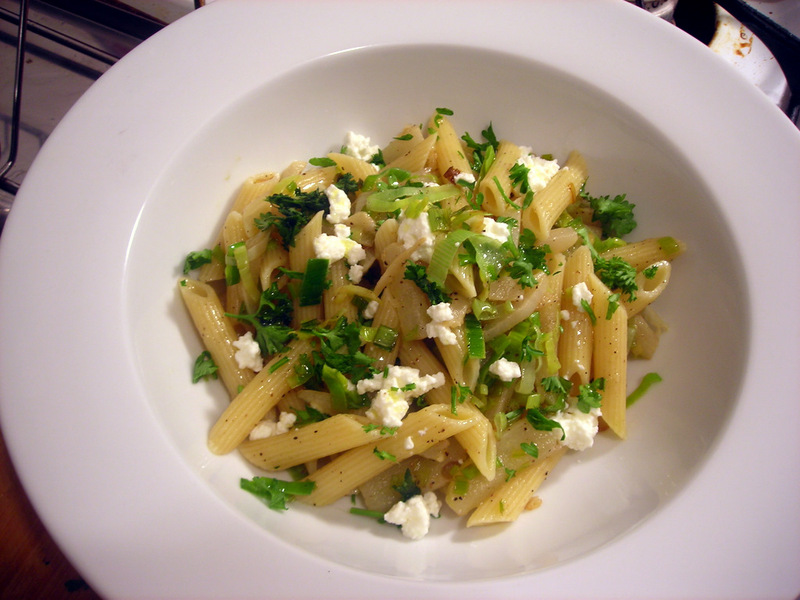 Here, it’s featured in a pasta dish, with sautéed leeks and dollops of cow’s milk ricotta cheese. Bring a pot of lightly salted water to a boil. Add turnips and cook until turnips are tender-crisp, about 2-3 minutes. Drain, then plunge into ice water. Drain again, and set aside. Prepare pasta according to package directions. Note that this recipe is sized for two servings, so adjust the quantity of pasta accordingly. Cook pasta until al dente, then drain, reserving some of the cooking water. Gently warm olive oil in a large skillet over medium heat. Add garlic; cook until garlic becomes a pale gold, about 1 minute. Add turnip to the pan. Cook, stirring occasionally, until turnips begin to turn a light gold, about 5 minutes. Remove from heat and set aside. Melt unsalted butter in the same skillet, over medium heat. Add leeks; sauté until leeks become translucent, about 3 minutes. Return turnip mixture to the pan. Taste for salt and pepper. If the pan seems too dry, add 2 to 3 tablespoons reserved pasta cooking water. Cook until turnips are warmed through. Add pasta to the skillet; toss. Taste for salt and pepper once again, then spoon into warmed serving bowls. Sprinkle with parsley and dollops of ricotta cheese. Drizzle with a little extra-virgin olive oil, then serve at once. Time: About 30 minutes, including prep. This is my submission for Presto Pasta Nights #246, a weekly foodblog event hosted by Helen of Fuss Free Flavors and organized by Ruth of Once Upon a Feast. 11 Jan	This entry was published on January 11, 2012 at 2:04 am. It’s filed under food, food photography, Italian food, Presto Pasta Nights, vegetarian, winter and tagged dinner, leeks, turnips. Bookmark the permalink. Follow any comments here with the RSS feed for this post. Definitely drool worthy! Thanks for sharing with Presto Pasta Nights. It seems I’m always attracted to super green pasta sauces in the middle of dreary days of winter. What a beautiful picture! I love any excuse to use leeks in a dish. This looks great – and I’m actually looking for ways of using up leeks at the moment! I’d never have thought to use turnips in pasta but I like the idea. hi Corina. turnips can also appear in risotto, but for that kind of dish I have to wait until spring or fall when they’re smaller, sweeter and more tender than their more mature counterparts. almost any vegetable can appear in pasta. it just requires a little forethought and creativity sometimes. How many servings does this make? Great recipe, just one more detail needed. I want to make this, just for a family of 8.
hi Calvin. The recipe as written serves two or one ravenous eater. You’ll have to adjust the proportion of the ingredients for 8 people.